Have fun with our this self watering system planter! You can use different kinds of plants to create the beautiful landscaping you want. It great for decorate the wall which around you, no matter inside & outside on walls, railings, patios, balconies or anywhere else. The watering system make you watering plants quite easy, the water through top layer to bottom layer with efficient control. The Filter Layer make you could put soil and plants into planter directly without nursery pot and keep plants breathes well. The extra water stored between planter and liner. It can keep plants have enough water last for two weeks. Works indoor or outdoor( wall, railings, patios, balconies or anywhere else ) ; Use the screws to fasten it on the wall or fence, put the plants in, and hang planter up, done! 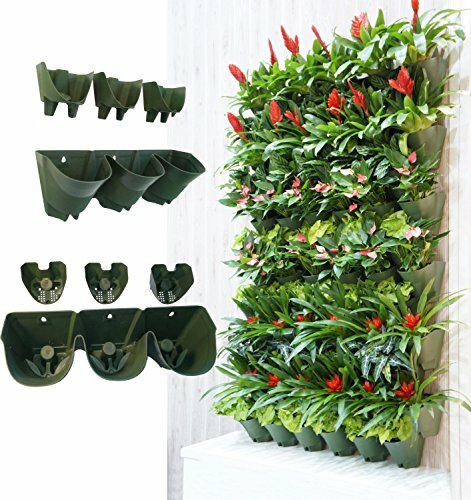 Professional grade automatic drip irrigation syetem; Quite perfect for Indoor,outdoor and landscape Engineering decor; Made from heavy-duty plastic,14 sets planter can cover one square meter area of wall. If you have any questions about this product by SHANGHAI WORTH, contact us by completing and submitting the form below. If you are looking for a specif part number, please include it with your message.